The reason most people don’t like government deficits is that they are assumed to crowd out private sector borrowing, thus discouraging business investment. But companies in the US, even in the last expansion, were net savers. That pattern has taken hold in advanced economies, even in many emerging economies ex China, since the mid 2000s, and some as early as the late 1990s. Andrew Haldane, the director of financial stability for the Bank of England, confirmed that companies and investors are taking an excessively short-term perspective, which is leading to underinvestment. In simple terms, the household sector always wants to save. If the business sector also perversely wants to save, then government needs to take up the slack and deficit spend, otherwise wages and GDP will contract (if you run a big trade surplus, you can escape that conundrum, but that isn’t germane for the US). If GDP contracts, debt to GDP gets worse, not better. Conversely, when the economy is strong and the business sector is borrowing to expand operations is when the government sector should run a surplus. Should We Panic Over the Level of Federal Debt? The US has addressed debt burdens before. Between the end of the second world war and 1960, the nation cut its debt-to-gross domestic product ratio in half from 109 per cent to 46 per cent through economic growth and avoiding additional debt accumulation. The US debt problem is now more difficult. Since 2008, the ratio of federal debt held by the public to GDP has risen from 40 per cent on its way to over 90 per cent by 2020, an alarming increase outside of major wartime experience. Today’s problem is not a past war, but ever-rising future debt burdens unless we take action. Our chart shows the federal debt held by the public (DHP) to GDP ratio as well as total Federal Debt (TD) relative to GDP from 1939 to 2011 (projected) as reported in table B.79 of the Economic Report of the President 2010. Note that this 90% projection for DHP/GDP in 2020 is not as high as the ratio for 1945 but it is entirely possibly that TD/GDP will reach 120%. Why would the Federal debt problem be more difficult now or even in 2020? This topic has received substantial attention of late – with a couple of mentions to Paul Krugman and the CBPP . Paul talks about debt arithmetic, which is reminiscent of Sargent and Wallace’s Unpleasant Monetarist Arithmetic . Let’s pessimistically assume that by 2020 we have a steady state real interest rate equal to 4% and real growth equal to 3%. If we could obtain a non-interest surplus to GDP ratio equal to or greater than 1.2%, then we could avoid a debt explosion and in fact might even see the debt ratio decline over time. Glenn argued that we enjoyed a reduction in the debt ratio from 1945 to 1960, which is true. In fact, the debt ratio continued to decline during the 1960’s and 1970’s despite the Vietnam War spending and the various recessions we had during the Nixon, Ford, and Carter Administrations. The CBPP chart shows that the explosion in the public debt ratio discussed by Glenn Hubbard comes from three primary sources: (1) the Bush tax cuts (I don’t exactly recall Glenn objecting to these when he worked for the Bush Administration); the two wars started at a similar time; and (3) the recession and fiscal policy moves designed to limit the recession. Robert Barro back in 1979 noted that the US economy often saw jumps in the debt to GDP ratio as the result of major wars and recessions but for its history up to then, long-term fiscal policy tended to retire this debt over time. Ah but this was another example of the Cheshire Cat in economics – as soon as an economist documents this tendency for long-term fiscal responsibility, we get the Reagan tax cuts which were not accompanied by meaningful spending cuts. So the debt ratio rose dramatically until the fiscal discipline movements of the 1990’s – which were in part defense spending cuts and largely tax increases – began to show up in a debt ratio that began to decline. At least until we had the fiscal irresponsibility of the Administration that Glenn Hubbard served. We should, however, mention the elephant in the room which is the projected increase in Federal spending on health care. The Administration that Glenn Hubbard served made the problem worse as it added a prescription drug benefit without adding any revenues to pay for it. The current Administration managed to pass health care reforms that would tend to limit this growth in spending but with no support from the Republican Party. And yet it is this same Republican Party that not only refuses to consider any revenue increasing measures but wants to cut taxes even more. We should close with admonition that fiscal discipline during a weak economy does not necessarily improve the situation with a hat tip to Brad DeLong . So what, you might ask? 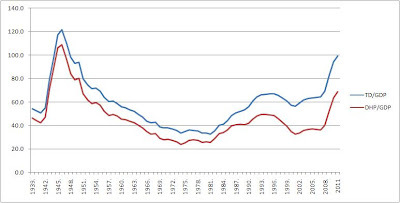 Well, the word is out that the most recent year tax revenues as a percent of GDP were as low as they are now was 1958, http://www.usgovernmentrevenue.com/downchart_gr.pap?years1900_2010%units=p&title=Revenue%20%20percent%20%20GDP . This might explain why in the push for a balanced budget, while cutting taxes even further, the Ryan plan seeks to drastically cut Medicare by turning it into a premium support voucher system, with the elderly having to cover most of their expenses out of pocket. Back in 1958, both the old and the poor had to pay for all their own medical care. What a paradise! So, if there was neither Medicare nor Medicaid, what was in the budget back then? Of course, government spending was lower as a percent today, those Eisenhower budgets generally being close to balanced, although as 1958 was a recession year, there was a deficit in that one. Well, the much bigger item in percent terms was national defense. After all, it was the Cold War, and the year before the Soviets had beaten us into space scarily with their launching of Sputnik. But, we need to pay respect here to this drive to lower taxes. After all, we could go back further to when there was no Social Security either, and defense was lower, you know, maybe 1917 when we were just getting into WW I and that darned debt ceiling first got installed, only four years after the federal income tax was adopted, an even greater paradise! Or, better yet, go all the way back to a century ago before there was a federal income tax. After all, newly possible prez candidate Rick Perry wants to get rid of it. And, hey, in the logic of the political supply siders who constantly tell us that revenues always go up when tax rates go down, this would be the ultimate solution for our budget woes and debt ceiling and all that, since zero tax rates should make the revenues higher than any other possible outcome, gosh darn it! That's it. First Obama openly states in a joint press conference with Israeli PM, Netanyahu, longstanding US policy with regard to Israeli-Palestinian negotiations that final borders should be based on the 1967 borders with land swaps, leading to Netanyahu not only openly objecting to this strenuously, but to getting 28 standing ovations in Congress for complaining further about this to a mere 26 that Obama received for his State of the Union message; but now Obama flubbed a toast to the Queen of England, speaking over their national anthem as the orchestra began playing it in the middle of Obama's toast, an unforgivable blunder on the part of Obama, who clearly should have stopped in mid-sentence, as Rush Limbaugh explained in a 6 minutes and 42 seconds moment by moment explanation, clearly showing Obama's total unsuitability to serve as president ( http://www.mediate.com/online/limbaugh-rails-obama-on-toast-flub-im-tired-of-people-making-excuses-for-these-people ). Clearly, these actions by Obama are grounds for impeachment. And, actually, it might be good to have those impeachment hearings going on those vitally important grounds, so that nobody will bother if Obama ignores the debt ceiling limit come August 2 and just orders US Treasury Secretary Geithner to just keep on issuing fresh US bonds to cover bills previously approved by the US Congress as they come due. Makes sense to me, :-). This has been floating around the blogosphere for awhile now, but figure we could all use a few chuckles, originally due to Sarah Skwire , http://www.modifiedrapture.com/wp/?p=210 . 1. You've got the curves to supply my demand! 2. Let's go to bed and try to disprove the law of diminishing marginal utility. 3. You're my very favorite kind of moral hazard. 4. I have a feeling you really understand the "nature of the firm." 5. Baby, I love you so much, I'm willing to forgo my exit option. 6. Wanna talk about our private goods? 7. You're an economist, I'm an economist. How about a little horizontal integration? 8. Now those are some tangible assets. 9. I'll reveal my preferences if you will. 10. Bottom up or top down? Figure 1 of her CBPP discussion says a lot. First of all – the rise in food stamp recipients is a consequence of the Great Recession. As the economy recovers, food stamp payments are projected to decline. Of course countercyclical fiscal policy is seen as a bad thing by this generation of Herbert Hoover Republicans. The other thing to note is that food stamp expenditures were less than 0.3 percent of GDP before the Great Recession and are projected to fall below 0.3 percent of GDP over time. As usual – GOP fiscal “discipline” is limited to big cuts in small programs. We are indeed approaching an unprecedented situation. As I have repeatedly pointed out, the US is the only nation ever to have a nominal debt ceiling, long ignored as a trivial matter since its imposition in 1917, given the routine way it has been raised so many times previously. But now we approach a battle royal, where House Republicans refuse to allow for any tax increases as part of any deficit reduction deal, and it would be extremely unwise of Obama or the Dems to agree to the more radical of their demands for spending cuts, including the fact that the only way they can defeat Obama next year is if they can engender a financial crisis leading to a return to a recession, which they can then blame on him. And if he is foolish enough to let them do that, well, then he may deserve not to be reelected. So, my proposal is that if the Congress is unable to come to some sort of reasonable deal that will allow a vote on raising the debt ceiling, Treasury Secretary Geithner should simply ignore the debt ceiling and continue to pay the bills as they come in, thereby avoiding any defaults or spending cuts or financial crises. The fact is, in the absence of any direct instructions from the Congress on which bills should be paid and which should not be in the face of crashing into the debt ceiling (surely we are not talking about paying no bills at all), he has no authority not to follow the instructions of the Congress in its latest budget, and spend what has been mandated. That will be the last coherent instruction from the Congress, and I say he should obey that in the absence of anything else more specific. Indeed, it will be the only responsible thing to do. Now, many might complain that "the law is not being obeyed." Well, yes, and I think that is too bad. But many laws fail to get enforced. The last administration clearly broke our laws against engaging in torture, but they were not and are not being punished, although supposedly we are torturing no more now. About half the states have anti-adultery laws, but the only case I am aware of within decades of any of them being enforced was an absurd one near me in Luray, Virginia, where a district attorney was arrested for it after his mistress turned him in, testifying against him. He had been stupid enough to cheat on this mistress, but it was for cheating on his wife that he was officially put away. As it is, this debt ceiling limit, not in force in a form like ours anywhere else (The EU has rules tied to percent of GDP, 60%, but never enforced with some countries in permanent violation, e.g. Belgium), is a stupid law anyway, like those laws against adultery. It should simply be ignored, the sooner the better, so as to render it irrelevant. Tea baggers may bring lawsuits, but who is going to arrest the Treasury Secretary? Will a court have the nerve to start making specific rulings about what should be cut and what should not be cut, or what taxes should be raised to meet the debt ceiling? No. My main regret is that this charade will move us ever that closer to becoming a banana republic. But, if it comes about, it will be because we have banana Republicans in the House of Representatives. As Barkley reminds, the Day fast approaches. Sincerely do I hope, fervently do I pray that those who count on being raptured out of here come the 21st will indeed get their wish. But speaking of judgement, it's the grading season. My favorite exam was the one that defined "Aggregate Demand Externality" as follows: "When an increase in money demand leads to pollution." Mad About Mahdis: Will The Hidden Imam Dis-Occultate? I have already been too worried about the Rapture supposedly going to happen on May 21, according to Harold Camping of Family Radio Ministry, although he said this would happen once before already, and it didn't. In any case, I am glad that my wife, Marina, is scheduled to fly home from Moscow on May 22, so she won't have her pilot zooping off to heaven while her plane is halfway across the Atlantic Ocean. But now comes the news reported by John Burgess at http://xrdarabia.org/2011/05/12/on-the-end-times-iranian-shia-version that various Iranian Shi'i clerics are being charged with sorcery for forecasting that the 12th Imam, who has been Hidden in Occultation for many centuries, will appear soon, bringing the end of the world. If they Hidden Imam dis-occultates, nobody will need to obey the government, so, wow, big surprise that the current government (already reacked by internal conflicts of various sorts) is cracking down on this sort of stuff. The good news is that apparently the Hidden Imam will only pull this trick three years after King Abdullah of Saudi Arabia dies, and as he is still alive, well, I guess we have at least three more years before this happens. Of course by then, Oct. 21 will have passed by, when, according to Camping the world will have already ended following the upcoming Rapture on May 21. In any case, with all this sort of stuff coming up, who needs to worry about a failure to raise the debt ceiling (or better yet, simply abolish it all together)? Is Paul Ryan Endorsing the Reagan-Greenspan Social Security Reform? Social Security is financed through a pay-as-you-go system, which means that current workers’ Social Security taxes are used to pay benefits for current retirees … Real reform – especially with respect to Social Security – must reflect demographic reality. In order to ease the burden on workers during the retirement of the baby boom generation, the 1983 Social Security Reforms set payroll taxes above the level needed to pay current benefits, thus partially prefunding the baby boomers' retirement. The military and civil service retirement programs followed suit in the mid-1980s and switched from pay-as-you-go financing to funded systems. The excess income generated by these retirement programs was held in the federal trust funds, which have accumulated almost $3 trillion since the reforms took place. In other words, we did have real reform in 1983. Nataraj and Shoven, however, caution that focusing on the unified budget may have led the government to reduce taxes and increase spending such as we did during the Presidency of George W. Bush. Funny thing – Congressman Ryan wants to cut income taxes even further. The massive borrowing and spending by the Treasury Department crowded out private investment by American businesses of all sizes. House Speaker John Boehner, giving Wall Street leaders his prescriptions for growing the U.S. economy and reducing the nation’s debt, built his case on several assertions that are contradicted by market indicators and government reports ... Boehner’s statement in his Wall Street speech that government spending “is crowding out private investment and threatening the availability of capital” runs counter to the behavior of credit markets. “Look at interest rates. Look at capital spending,” said Nariman Behravesh, chief economist of IHS Inc., a research firm based in Englewood, Colorado. “It’s very hard to come to a conclusion that there’s any kind of crowding out.” The cost of borrowing is low by historical standards. Yields on 10-year Treasury notes were 3.21 percent and yields on 2-year Treasury notes were 0.59 percent at 5 p.m. in New York yesterday, according to Bloomberg Data. Average spreads on investment-grade corporate bonds have narrowed from 1.64 a year ago to 1.39 on May 9, according to Barclays Capital. It is nice to see real reporting on economic issues and the claims of certain politicians! I have now had a chance to view the Econ Stories pieces done by John Papola with Lord Robert Skidelsky, including the one that supposedly provides the basis for the now-controversial Round Two of Keynes vs. Hayek, particularly the remark by "Hayek" accusing "Keynes" of having a "central plan." It is unclear what preceded the remarks by Skidelsky, but in the video showing him discussing the matter, with his comments interspersed with pieces from the Keynes vs Hayek video, there is no question that he asserts that Hayek was most motivated to criticize Keynes by his own fear of Soviet central planning (and his participation in the socialist planning controversy), even as he (Skidelsky) admits that Hayek never accused Keynes of being a central planner. Rather the issue was that he saw Keynes as a "thin wedge" for others who might be "let loose" to support such central planning: http://www.facebook.com/video/video.php?v=10150165612007003&=281384538984 . What is really curious about this is that, as I commented before on an earlier thread on this, in his 2006 article, "Hayek vs Keynes: The Road to Reconciliation," which appeared in the Cambridge Companion to Hayek, 2006, Skidelsky never mentions this at all. He identifies Hayek as differing with Keynes on "where to draw the line" in government activities and also on his criticism of the "money motive." Skidelsky is clear that Hayek never thought Keynes supported central planning. The discussion in the video is rather strange. Skidelsky is clear that Hayek never commented directly on Keynes's General Theory in print. He states that if Hayek did comment, particularly in bringing up this recently developed central planning critique, he did so "privately." In effect, he reconfirms that Hayek never made such an argument in print, although there is no question that Hayek was much involved with the socialist planning controversy beginning in the 1930s. One item that Skidelsky seems to have missed is that during much of the 30s Hayek was working on his Pure Theory of Capital, published in the early 1940s, and reportedly viewed this as his fundamental critique of Keynes's ideas. The book did not get much attention, and it was after it was published that Hayek pretty much gave up arguing about Keynes's macroeconomics, although he would return to make comments about it later, more on grounds of its inflationary potential, again, not anything about some tendency to central planning. Recently reported letters from the early 1930s by people on both sides of the debate also show no signs of any focus on central planning as an issue. The letter by four London economists, including Hayek, criticizing Keynesian views, focused on the role of hoarding, arguing for stimulating investment over consumption, criticizing public investment ("not a time for new municipal swimming baths"), and argued for a return to free trade from the trade war triggered by the Smoot-Hawley tariff. Not a word about central planning, even as a distant possible threat. Bottom line here appears to have two points. One is that Papola and Roberts must be let off the hook on having put this claim by Hayek that Keynes supported a "central plan" into their video (and I apologize to them for blaming them). Of course, they did it, but it is also clear that Robert Skidelsky made such claims to them that supported what they did. What then is the final point of contention is when and where did Skidelsky come up with this view of what really bothered Hayek, given that he never said (or wrote) any such thing before, indeed appeared to specifically deny that Hayek made such an argument, and there remains no published evidence of Hayek ever making such a claim or argument about Keynes. So, let us blame Skidelsky for this fiasco of a misrepresentation of what Hayek thought about Keynes. Crooked Timber has a little Hume-fest going on with people sending their favorite quotes: David celebrates his 300th birthday today. I love reading Hume : I love the prose, that is - who doesn't? But much of what he says so charmingly strikes me as absurd. It is Hume that we can thank - and when I say 'thank' I mean, of course, 'curse' - for the Belief-Desire Model of rational agency. The economists' very conception of rationality is his inheritance. You know the quotes - "reason is and ought only to be the slave of the passions"; " tis not contrary to reason to prefer the destruction of the whole world to the scratching of my little finger" yadda yadda. (Incidentally, Smith in the Theory of Moral Sentiments says, in effect, it is contrary to reason to prefer the destruction of the whole world - well it's an earthquake in China, actually- to a scratch on my finger). But the thing is, if reason can't motivate without being filtered through some desire, we couldn't have an intellectual discussion, couldn't discuss the very question of whether practical reason is or is not purely instrumental, for example : if "discussion" means listening to and evaluating the arguments made, drawing conclusions from the evidence, changing one's view when confronted with an unanswerable objection- and so on. Reason must move me directly, e.g., to change my mind, to draw the conclusions that follow from what I believe - without any antecedent desire being necessary. And don't get me started on is's and oughts! I love The Dialogues on Natural Religion, I love the History of England. You can have The Treatise and the Enquiry, thanks. But I wouldn't have wanted to miss the former, so a grudging Happy Birthday, Davey.! Saving Medicare off the table? Absolutely not. Nothing is off the table except raising taxes. Tax hikes will hurt economy & job creation. So the Ryan proposal is supposed to “save” Medicare by eliminating it! George Orwell would be proud! For the second straight year, the recovery seems to be at risk of stalling. The economy grew at an annual rate of only 1.8 percent last quarter — eerily similar to the 1.7 percent growth last spring, just when job growth started slowing down ... White House advisers and Ben Bernanke, the Federal Reserve chairman, argue that the bad news is a merely a blip caused by bad weather, a temporary cut in military purchases and other one-time factors. They may be right, too. Stock market investors certainly share their optimism: the Standard & Poor’s 500 index is near a postrecession high. For the entirety of 2010, real GDP growth barely undone the decline in real GDP for 2009. And with zero growth for 2008, our economy is around 10% below potential GDP. So even if this were a blip and we returned to growth rates around 3% or 4%, we will be far below full employment for quite a while. Well, the debate over my post on Keynes on central planning has gone viral all over the place, and I shall make no attempt to link to all of it. However, I do want to comment further on a point raised actually in Facebook debates on this by one of the makers of the video in question, John Papola. This has to do with the accusation that Keynes was (maybe) a supporter of what has been called "military Keynesianism," with the point being made in the video that unlike what lots of Keynesians supposedly said (Samuelson being provided in the debates as an example in 1943, although not Keynes himself), we did not go into a deep depression after WW II, even though there was no massive fiscal stimulus and there was this sharp drop in government spending with the end of the war. This curiously relates to a matter that has been much argued about previously on various blogs, namely the nature of the short and sharp post-WW-I recession of 1919-20. Some have argued that this shows how wrong Keynes was, because laissez-faire was followed, including letting prices (and some wages) fall sharply in 1921, with the economy bouncing back very nicely, after having the unemployment rate soar from 5% in 1920 to 9% in 1921. Most economic historians have attributed this recession to "postwar adjustment problems." OTOH, some of those making a big fuss about that recession somehow fail to notice that in fact there was a post-WW-II recession, if also very brief, if sharp. It occurred in 1945 with the sharpest decline in wartime spending, although not much remembered. However, the official stats have US declining in GDP by a whopping -12.7% in that year, although that number must be taken with some grains of salt due to all kinds of measurement issues and restructurings. Some say this exaggerates things as the unemployment rate only went from 1.5% to about 3.6%, a rise, but not all that much to get worked up about. Two points. The first is that this latter event does not account for the massive decline in female labor force participation that occurred in 1945, from about 38% to about 30%. We all know (or should) that those withdrawing from the labor force do not count in the unemployment rate. That not very large increase in the UR does not disprove that there was a sharp (if short) decline in GDP. (Rosie the Riveter went home to boom out those babies, and to buy houses to be built, given that basically none had been for about 15 years in the US). The other point, which is perhaps more cogent for the debates here, involves monetary policy. Frightened of rising inflation, the inexperienced Fed raised the discount rate sharply during 1919-20, halting doing so in June, 1920 as it became clear that the economy was plunging into recession. OTOH, the very loose monetary policy of WW II basically continued during the immediate postwar years, only finally ended with the Fed-Treasury Accord of 1951 in the face of rising inflation tied to the Korean War. So, it may well have been that the Fed was listening to Samuelson and was slow to tighten monetary policy, thereby helping to ease that postwar transition and make sure that the one after WW II was not as sharp as the one after WW I, despite the much larger adjustments that were made. Added: For some strange reason the system is not allowing me to comment. So, I shall reply to some comments here in the main post. OK, I grant that you have "Keynes" saying "too bad" about the wartime achievement of full employment and accept that you recognize that he was a pacifist prior to WW II. In the same place he made his statement you quote he expressed optimism that full employment could be achieved after the war with aggregate demand management without interfering with individual decisionmaking. I am not sure why you cite Higgs on reduced consumption levels due to rationing and so forth in WW II. Everyone knew about that, certainly including Keynes who discussed such matters in his "How to pay for the war," which was all about restraining the excessive aggregate demand associated with the war. 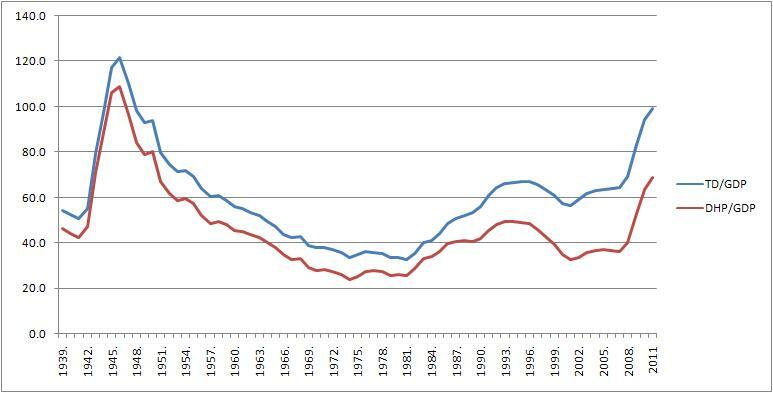 I continue to maintain that one needs to track labor force participation. Womens' participation rose at the beginning of the war above anything previously seen and then fell at the end of the war sharply. Anyone who quotes unemployment rate changes without noticing that is being disingenuous at best. I have no problem at all with tracking employment rates (percent of working age employed) rather than unemployment rates, which have always been known to suffer from these problems. The recession started in Feb. 1945, but went on for 8 months, with NBER giving the GDP decline as -12.7%, larger than any since, including our most recent recession. Sure, there were measurement issues and index number problems with all that restructuring, but the 2% increase in the official unemployment rate combined with the 8% decline in female labor force participation is consistent with a pretty sharp decline in GDP, if not necessarily a full -12.7%.